Risingbd Desk: The first burst of light given off by an exploding star has been captured for the first time by an amateur astronomer in Argentina. 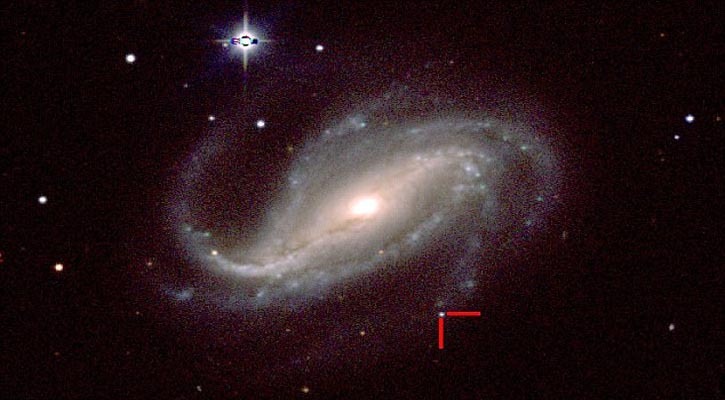 Observations of a dying star 80 million light-years away, taken by Víctor Buso, 60, has given scientists their first view of the initial flash given off by a supernova. To date, no one has been able to capture the 'first optical light' from a supernova, since stars explode seemingly at random in the sky, and the burst is fleeting. Most are only spotted a long time after the initial blast, making Mr Buso's one-in-ten-million observations 'unprecedented', scientists said.The new data provide important clues to the physical structure of the star just before its catastrophic demise and to the nature of the explosion itself. 'Professional astronomers have long been searching for such an event,' said University of California at Berkeley astronomer Dr Alex Filippenko, who followed up the lucky discovery with scientific observations of the explosion, called SN 2016gkg. During tests of a new camera, Mr Buso snapped images through his 16-inch telescope of the galaxy NGC 613, which is 80 million light-years from Earth. He took a series of short-exposure photographs of the spiral galaxy, accidentally capturing it before and after the supernova's 'shock breakout'. This is when a pressure wave from the star's exploding core hits and heats gas at the star's surface to a very high temperature, causing it to flash and rapidly brighten. Upon examining the images, Mr Buso, of Rosario, Argentina, noticed a faint point of light quickly brightening near the end of a spiral arm that was visible in his second set of images but not his first. Astronomer Dr Melina Bersten and her colleagues at the Instituto de Astrofísica de La Plata in Argentina soon learned of the serendipitous discovery. They realised that Mr Buso had caught a rare event, part of the first hour after light emerges from a massive exploding star. A supernova occurs when a star explodes, shooting debris and particles into space. A supernova burns for only a short period of time, but it can tell scientists a lot about how the universe began. One kind of supernova has shown scientists that we live in an expanding universe, one that is growing at an ever increasing rate. Scientists have also determined that supernovas play a key role in distributing elements throughout the universe. There are two known types of supernova. The first type occurs in binary star systems when one of the two stars, a carbon-oxygen white dwarf, steals matter from its companion star. Eventually, the white dwarf accumulates too much matter, causing the star to explode, resulting in a supernova. The second type of supernova occurs at the end of a single star's lifetime. As the star runs out of nuclear fuel, some of its mass flows into its core. Eventually, the core is so heavy it can't stand its own gravitational force and the core collapses, resulting in another giant explosion. Many elements found on Earth are made in the core of stars and these elements travel on to form new stars, planets and everything else in the universe. She estimated Mr Buso's chances of such a discovery, his first supernova, at one in 10 million or perhaps even as low as one in 100 million. Dr Bersten contacted an international group of astronomers to help conduct additional frequent observations of SN 2016gkg. A series of subsequent studies have revealed more about the type of star that exploded and the nature of the explosion. Mr Buso's discovery, snapped in September 2016, and results of follow-up observations have now been published in the journal Nature. 'Buso's data are exceptional,' Dr Filippenko added.